My four year old, James, and I are in the midst of an intense, ongoing biblical debate regarding the book of Genesis, more specifically the story of creation. James was taught in school that God created everything. And in four-year-old speak, everything means EVERYTHING. “He made the trees and the grass and the sky,” he continued. “Yup, and beautiful flowers and animals too,” I added. “And He made the shopping carts and the cars and Target,” he further elaborated. This theological back and forth has become a part of our daily conversations over the past few weeks, with God’s personal creations ranging from kindles to Paw Patrol hoodies to Marvel movies. In James’ version of the creation story, God clearly went right back to work after his rest on the 7th day. 7″ Santoku Knife from Avon’s 16-Piece Multi-Pattern Knife Set and beautiful Serafina Collection Glass Cutting Board from Avon! Perhaps then, it was on the eighth day that God created Crab Cake Eggs Benedict?? If pressed to answer the age old question of, “If you were stranded on an desert island and had to live on only one food for the rest of your life, what would it be?” there’s a pretty decent chance that Crab Cake Eggs Benedict would be my reply. This is traditional Eggs Benedict, with a simple (and quite elegant) twist. In lieu of the standard Canadian bacon, I substitute one of my spectacular broiled crab cakes, loaded with decadent jumbo lump crab meat. A perfectly poached egg is nestled on top of the crab cake, then drizzled with a generous spoonful of homemade hollandaise sauce. A sprinkling of fresh chives completes the dish. Crab Cake Eggs Benedict in Azul Collection Melamine Bowl from Avon! Not too long ago, I felt strongly that a hollandaise sauce should always be made using the classic culinary technique involving the whisking of egg yolks with fresh lemon juice, as they gently cook, over a bain marie, while carefully adding precisely the right amount of clarified butter for the mixture to emulsify into a luscious and creamy sauce. It’s a finicky process, but one I was proud to have learned. Then, I had a life-changing moment. Out of a desire to minimize the number of messy pots and pans I was juggling during my Easter brunch, I decided to try the blender method. I’m not sure I’ll ever mess with bain-marie hollandaise again. The blender preparation is so incredibly simple, and as far as I can tell, produces a perfect, delicious hollandaise every time, which seems miraculously resistant to the common fussiness of hollandaise. God may not have created Paw Patrol hoodies or shopping carts, but I’m pretty sure he created Crab Cake Eggs Benedict made with blender hollandaise sauce. And He was pleased with what he tasted. Preheat broiler. Combine all ingredients, except the crab meat, in a bowl. Mix until well blended. Gently fold the crab meat into the other ingredients, taking care not to break up the chunks too much. 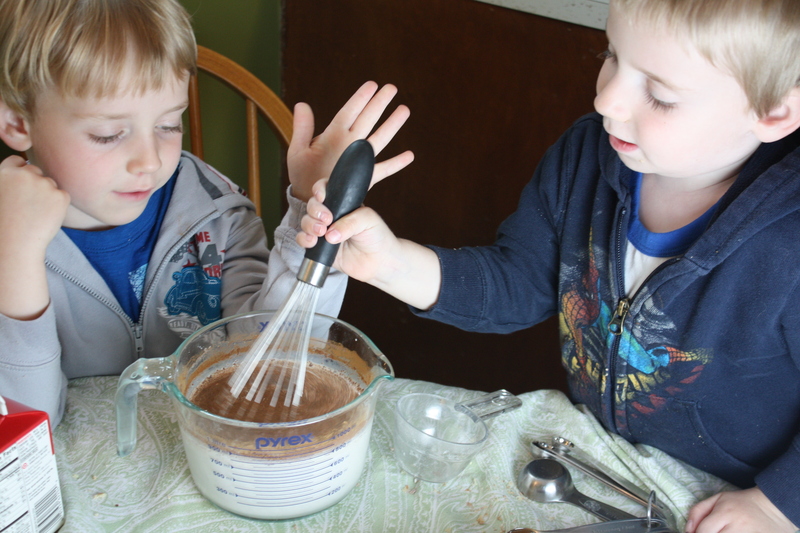 Use your hands to form eight equal sized balls of the crab mixture. Place the balls on a baking sheet and gently flatten into patties, approximately the same size as the English muffins. Place under the broiler and cook for about 10 minutes until completely heated through. Add the egg yolks, warm water, lemon juice, and cayenne pepper to a blender. Blend at medium speed for about 30 seconds or so, until frothy and slightly lightened in color. Meanwhile, melt the butter in the microwave until completely melted and hot. Turn the blender speed to low, and begin drizzling in the hot melted butter, in a slow steady stream. Blend for a few more seconds once all of the butter has been added. Taste and adjust seasoning with additional salt and/or cayenne pepper, as desired. Set prepared sauce in a warm location (near the stove, for example) until ready to use. Bring a few inches of water to a boil in a large saucepan. Add the vinegar. Reduce the heat to a gentle simmer. Carefully crack each of the eggs into separate ramekins, small dishes, or cups, being careful not to break the yolks. Carefully place each egg in the water, by lowering the ramekin to the edge of the water and letting the egg slip in. Use a spoon to gently nudge the whites closer to the yolk. Allow the eggs to cook for 3-5 minutes, depending on desired doneness. Remove the eggs with a slotted spoon and place on a paper towel to drain. TIPS: Poach eggs in small batches (four at a time) to make it easier to keep track of cooking time. Eggs can be poached a few hours ahead of time, then stored in a bowl of cold water in the refrigerator, until ready to use. To reheat, slip the eggs into a pot of simmering water for about 30 seconds up to 1 minute to reheat. Place a crab cake onto each toasted English muffin half. Set a poached egg on top of each crab cake. Drizzle with a generous spoonful of the hollandaise sauce. Garnish with chopped chives. 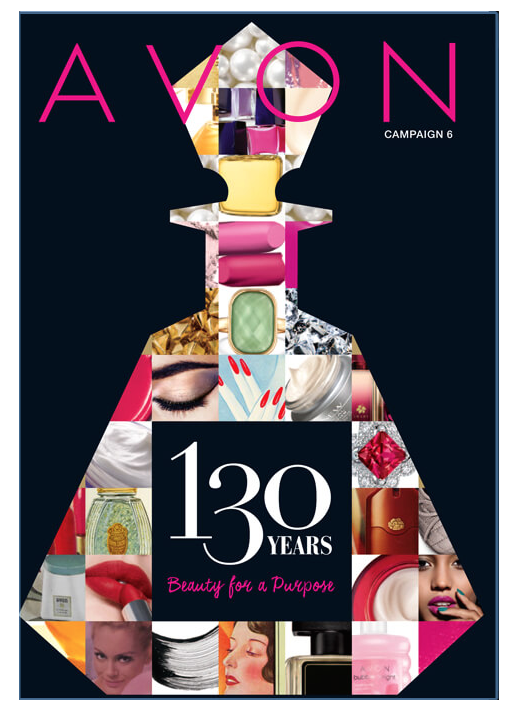 Posted in Food and tagged avon, Avon Living, comfort food, Cooking, culinary technique, Eating, family, Food, food photography, God, kids, life, parenting, Recipes. Bookmark the permalink. Julia Child was one of America’s first (and dare I say greatest ) culinary celebrities, in a time long before shows like The Next Food Network Star or Top Chef sought to discover such talent. She was just a woman with a passion for good food, which led her down the gastronomical path that ultimately brought her into America’s kitchens. It was her passion for food which led her on the journey. It was her charm, relatability, and contagious adoration of food which grabbed the attention of adoring fans all around the world. I love this woman. And having lived to be two days short of 92 years old, a lifespan which she attributes to a regular diet of gin and red meat, I’d say she knew what she was talking about. Well-prepared food is a pleasure to be enjoyed, even within the framework of a healthy lifestyle. Julia understood what really mattered. She knew that good food needn’t be complicated with elaborate presentation. She would say, “You don’t have to cook fancy or complicated masterpieces – just good food from fresh ingredients.” That’s all it really takes, isn’t it? It’s like this beef bourguignon, perhaps her most famous recipe and the subject of her very first televised episode of The French Chef on PBS. It’s a stew (with a fancy name that’s fun to say). But it’s a stew all the same, certainly not something most would consider fine dining. And yet, it’s probably one of the most delicious dishes you’ll ever eat. 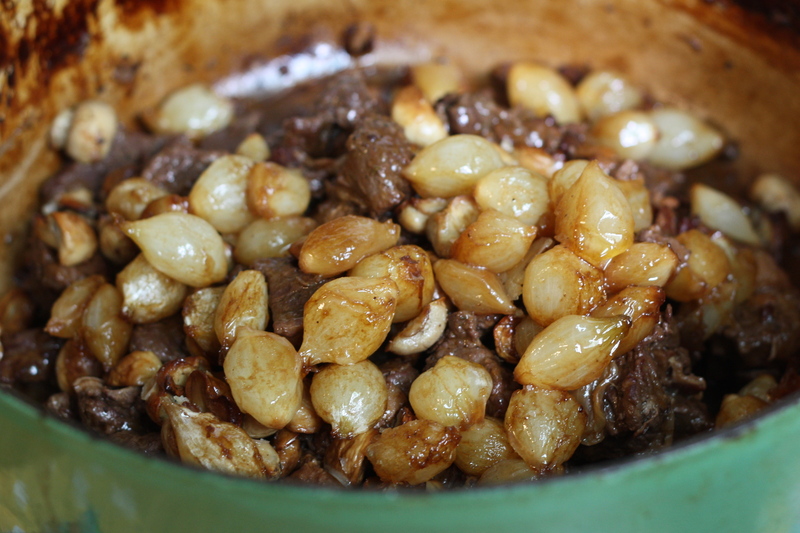 I started making beef bourguignon a few years ago as our Christmas dinner. I suppose it’s become our tradition at this point. We entertain a large crowd on Christmas and for a few years, I experimented with various menus, all delicious, but the beef bourguignon stuck. It’s enjoyed by everyone at the table and best yet, can be fully prepared the day before. In fact, it’s even better after sitting in the fridge overnight! 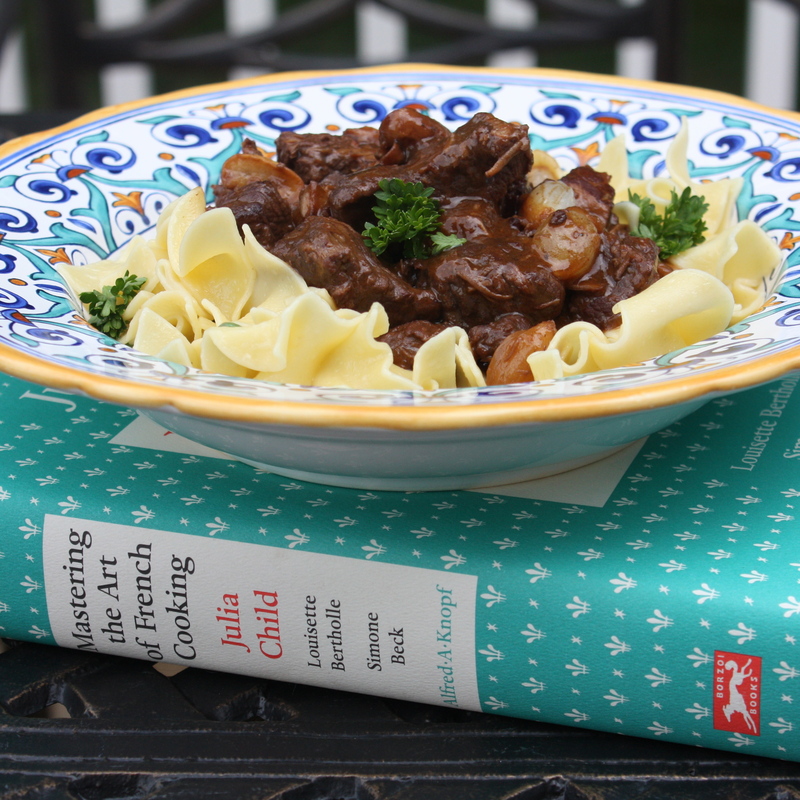 In honor of what would have been Julia’s 100th birthday (August 15), I prepared her infamous beef bourguignon. (I certainly wasn’t going to cook the roast suckling pig.) 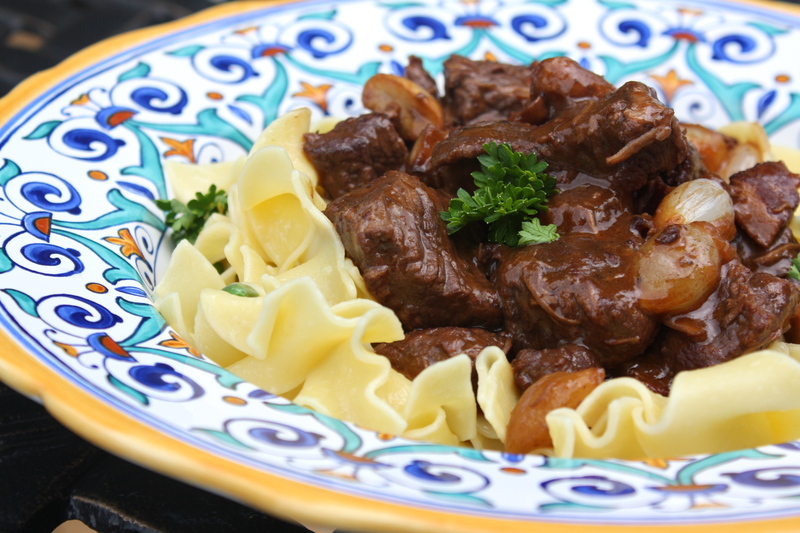 Beef Bourguignon is normally a recipe I would save for the colder months when it’s lovely to have the house warmed with the slow-cooking oven and flooded with the rich aromas of the dish. 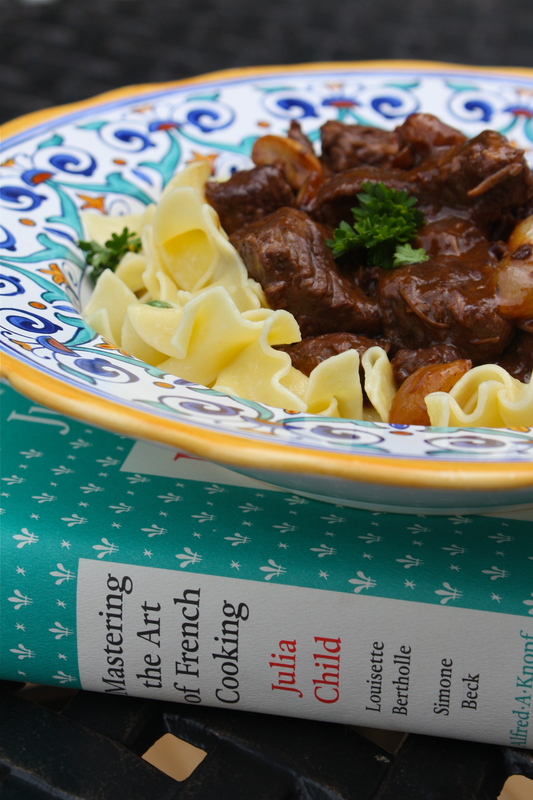 But when I think of Julia, I think of beef bourguignon, and so it had to be. 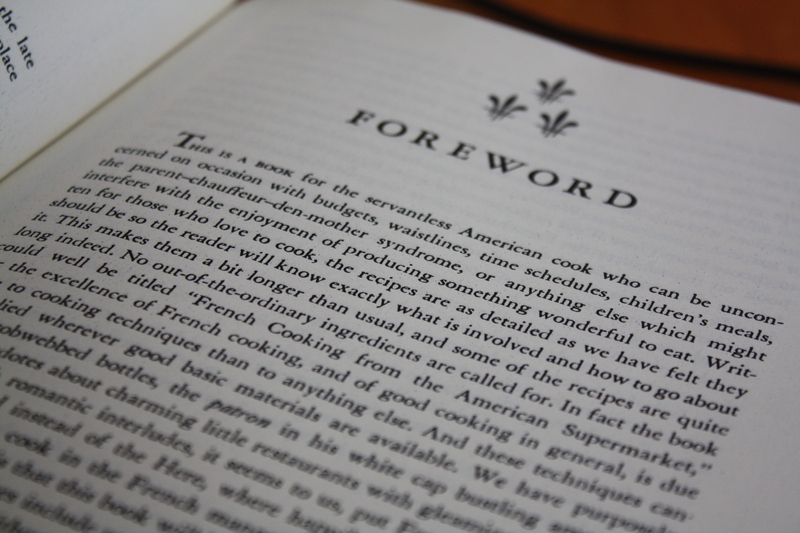 The original recipe can be found in Julia’s first book, Mastering the Art of French Cooking. She was a wise woman who fully recognized that some of the recipes contained in the book may require stretching one’s budget, waistline, time, and schedule, but such are the sacrifices we make in the name of something wonderful to eat. Like many of the dishes in her book, this dish takes some time, but there’s no step too complicated for even the most novice chef. Heed Julia’s advice and cook with abandon. As with many of the world’s greatest pleasures, anything worth having is worth the work it takes to get there. While I waited for my beef bourguignon to finish cooking, I turned on some music and danced in the kitchen with my boys. 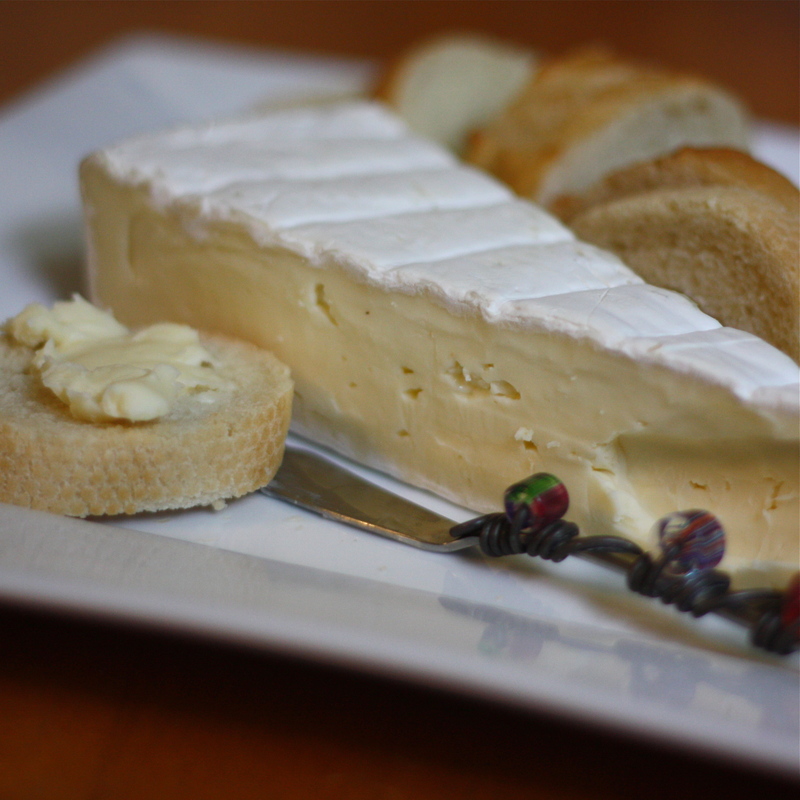 Then I poured myself a glass of wine and spread some creamy brie onto slices of French baguette. I’m pretty sure Julia would have approved. Happy 100th, Julia and Bon Appétit!! Gather and prepare your ingredients prior to cooking. 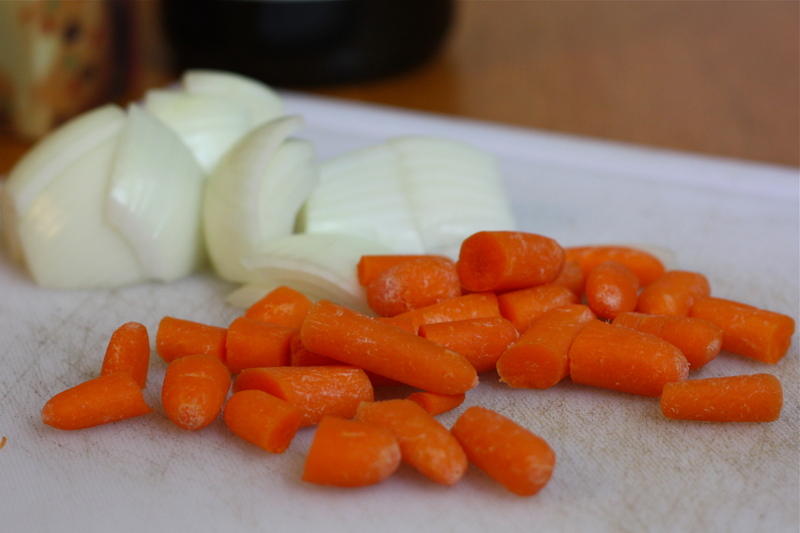 Chop the bacon, chop the beef, chop the veggies, smash the garlic… Preparing your ‘mise en place’ will help things go smoothly once you’ve fired up the stove. 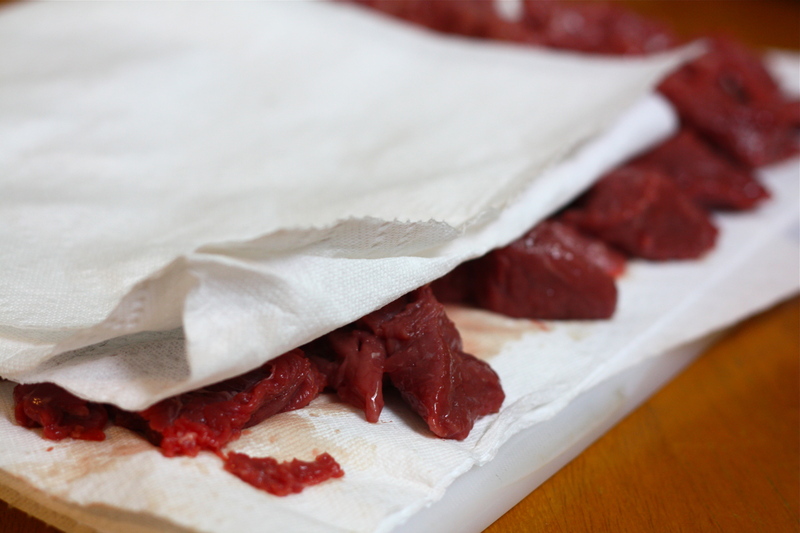 Arrange the beef chunks in a single layer on a tray lined with paper towels. Use additional paper towels to thoroughly pat the beef dry. *Damp beef will not brown properly. *Julia recommends chuck beef for stew meat. I usually use the precut ‘stew beef’ from my grocery store. It saves me a few minutes of prep time, which is invaluable when you’re cooking while three young boys threaten to tear the house (or each other) apart. In a large dutch oven pan, heat the olive oil over medium heat. Add the bacon and cook for several minutes, until the bacon is browned and has released most of its fat. 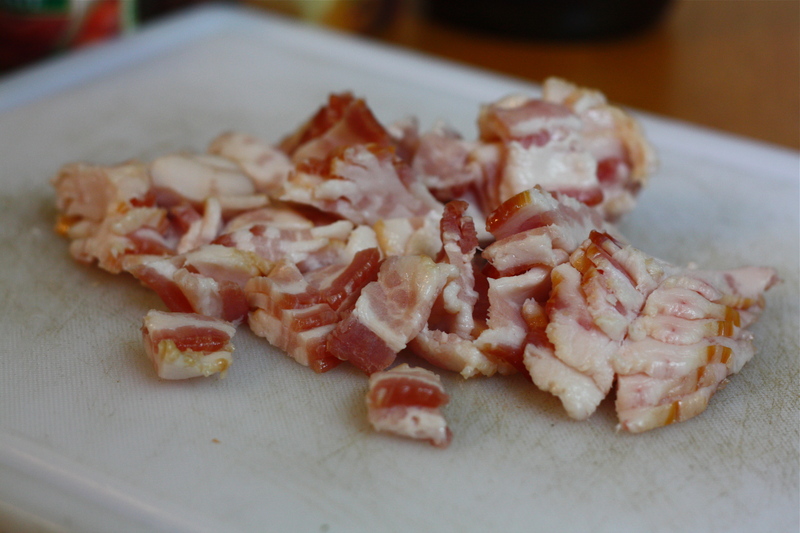 Use a slotted spoon to remove the bacon, leaving the fat in the pan. *Julia’s recipe calls for a 6 ounce piece of chunk bacon, cut into lardons. Regular sliced bacon will work just fine! *Any large, stove and oven-safe pan with a tight fitting lid will do the job. I use a 9-quart Le Creuset enameled cast iron french oven pan. Over medium/medium-high heat, brown the beef in the bacon fat for a minute or two on each side. Do not overcrowd the pan. The beef should quickly develop a nice caramelized brown on the surface. 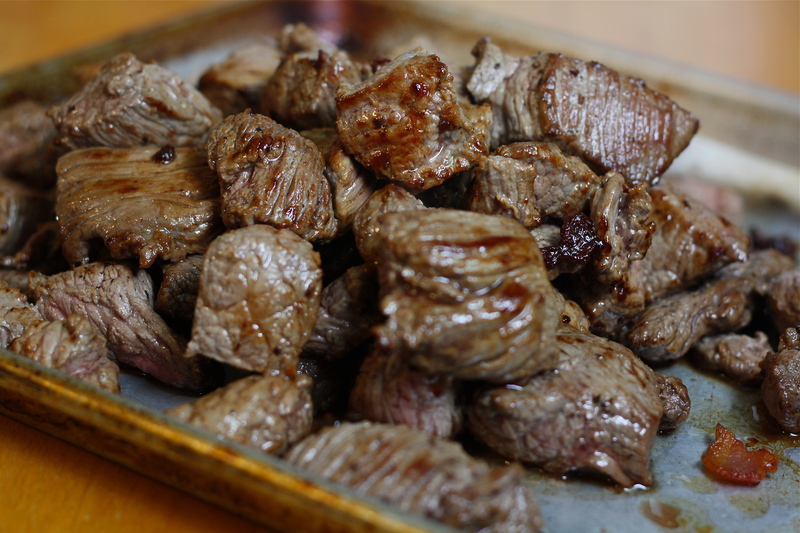 Turn the beef to brown on all sides, then remove with a slotted spoon and set aside. Repeat until all of the beef has been browned. *You do not want to steam or boil the beef. If your beef is not browning properly, it is either due to the heat not being high enough, the pan being over-crowded (which lowers the heat of the bacon fat), or the beef being too damp. Try adjusting each of these conditions. Once all of the beef has been browned, add the carrots and onions to the pan. Cook for a few minutes until they develop a golden brown color. Then, carefully pour out the excess bacon fat, leaving the veggies in the pan. Add the beef and bacon back into the pan. Toss with salt and pepper. Then, sprinkle the flour over the mixture and toss again. Place the pan, uncovered, on the middle rack of the preheated oven for 4 minutes. Toss the mixture, then cook for 4 more minutes. Remove the pan from the oven and reduce the heat to 325 degrees. Add the wine*, beef stock, tomato paste, garlic, and thyme. Add just enough beef stock to barely cover the beef. *Julia recommends Beaujolais, Cotes du Rhone or Burgundy. I use whatever dry red I have on hand, usually Merlot, Cabernet Sauvignon, or Pinot Noir. Use something you enjoy drinking. While you’re at it, go ahead and pour a glass. Julia wouldn’t mind. In fact, I think she would have encouraged it. Cheers! Bring to a simmer on top of the stove. Then, cover the pan, and place it in the oven. Cook, covered, for about 3 hours. Adjust the temperature slightly, if necessary, so that the liquid maintains a gentle simmer throughout the cooking time. While the beef is cooking, prepare the onions and mushrooms. Heat the butter and oil in a sauté pan over medium heat. Add the onions and cook for about 10 minutes, occasionally shaking the pan to allow the onions to roll around in the pan and brown on all sides. Then, add the beef stock. Bring to a simmer, then lower the heat. Cover and simmer slowly for about 15-20 minutes. Check the pan towards the end of the cooking time. 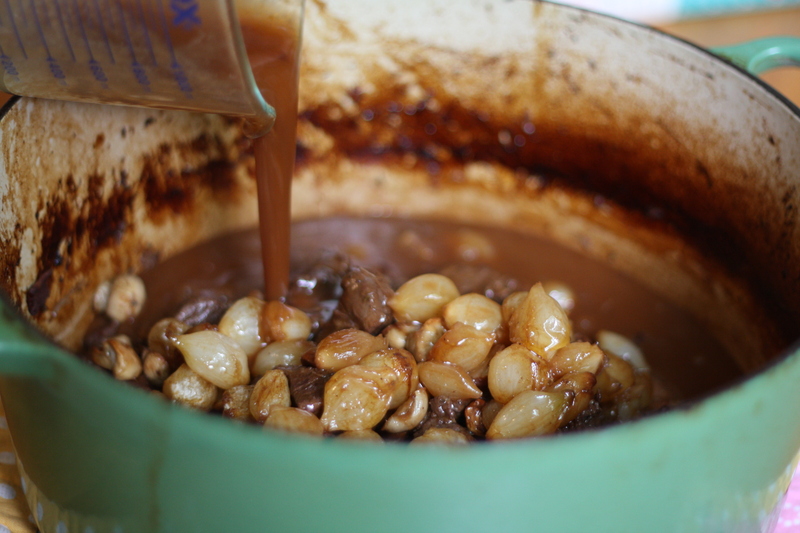 Most of the liquid should have evaporated and formed a brown glaze around the onions. Season with salt and pepper. Set aside. 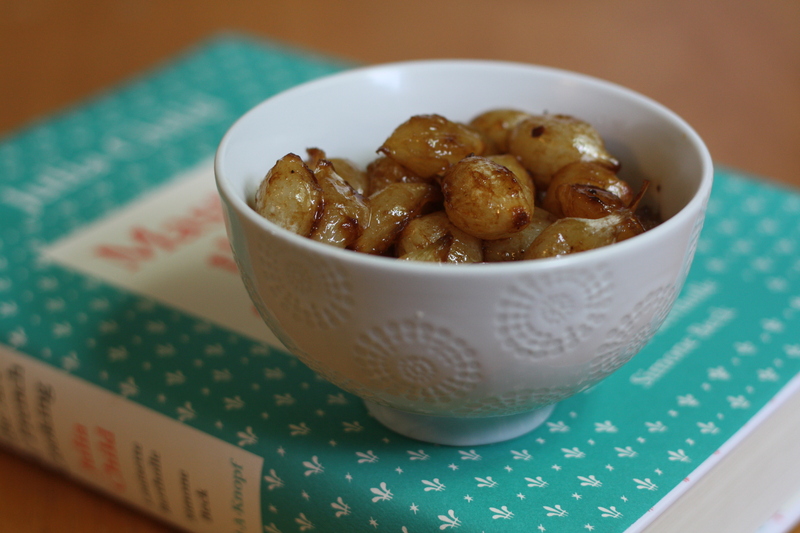 *Julia’s recipe calls for fresh, peeled white onions, about 1″ in diameter. 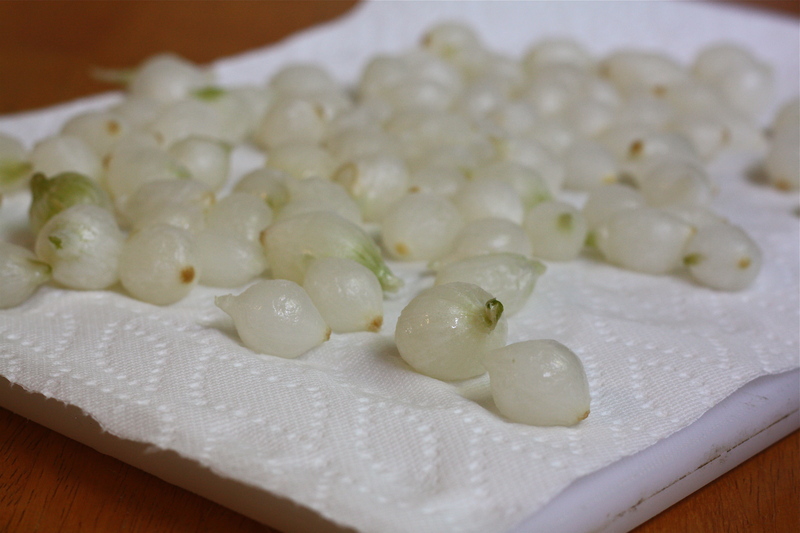 Since my grocery store does not regularly carry the small onions, I use about 1/2 a bag of frozen white pearl onions. The added convenience is that they’re already peeled! Just be sure to defrost completely and pat dry before sauteeing. Fresh onions will require longer cooking time, about 40-50 minutes. Heat the butter in a sauté pan over medium-high heat. Add the mushrooms. Cook for about 10 minutes, stirring frequently. *The mushrooms will at first appear to absorb the melted butter, but will eventually release the butter and their own liquid. 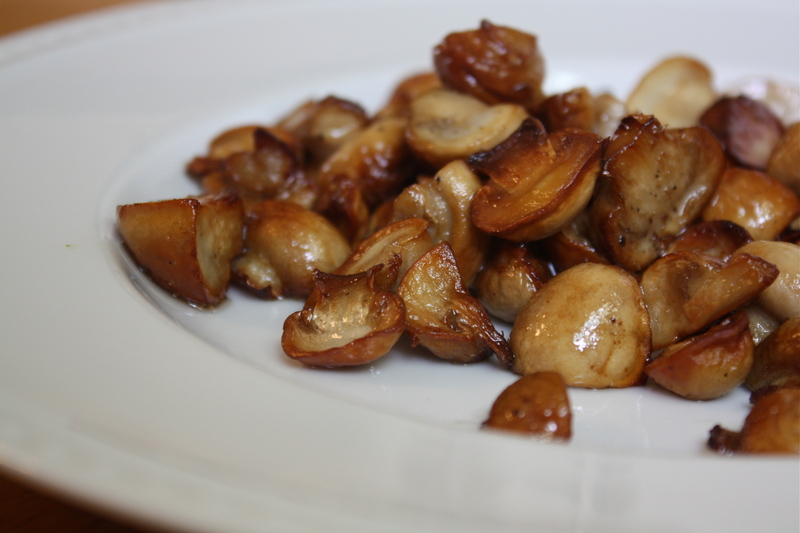 As the liquid evaporates, the mushrooms will acquire a golden brown color. Season with salt and pepper, then set aside. 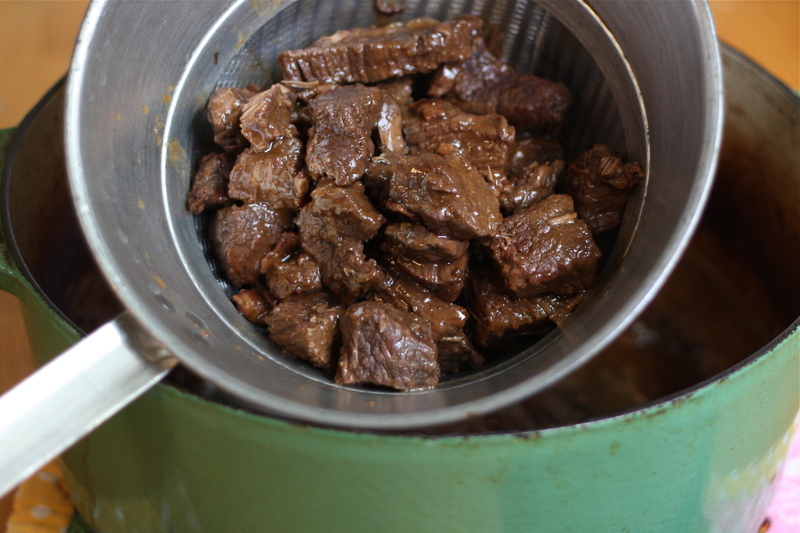 Once the beef has finished cooking, carefully pour the mixture through a sieve or strainer. 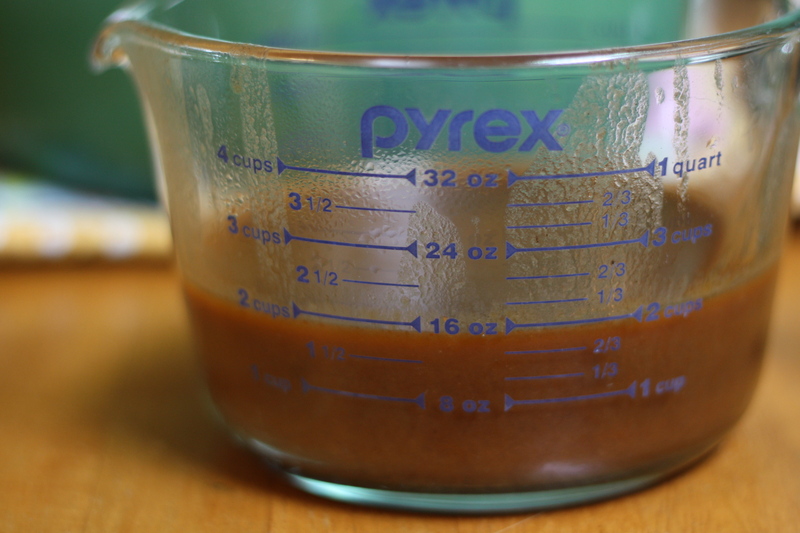 Allow the sauce to collect in a large measuring cup (the 4-cup kind) or glass bowl. Return the beef and bacon to the dutch oven pan. Discard the carrot and onion pieces. 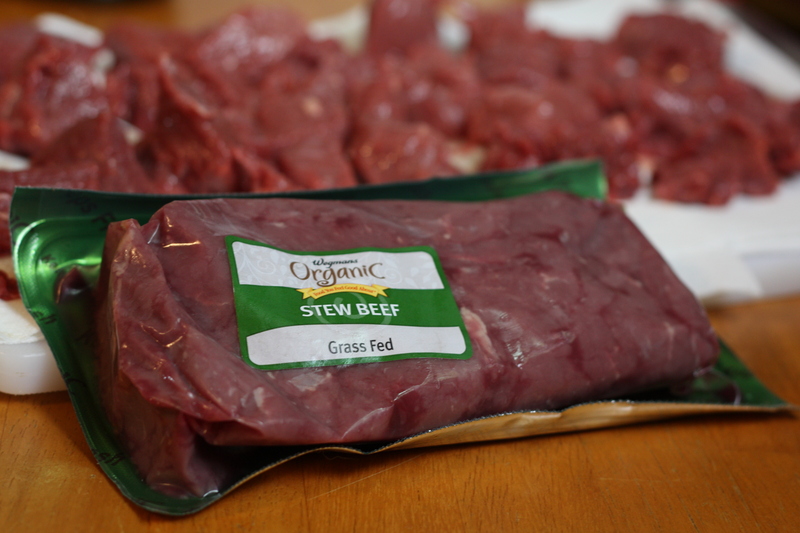 Arrange the brown-braised onions and sauteed mushrooms over the beef. Allow the sauce to rest for a few minutes. The excess fat will rise to the surface as it rests. Use a spoon to collect and discard the excess fat. Repeat until much of the excess fat has been discarded. You should have about 2 – 2 1/2 cups of sauce. If you have much more than this, pour the sauce into a small saucepan and simmer uncovered until it’s reduced a bit. It should be quite flavorful and thick enough to lightly coat the back of a spoon. Taste and adjust the seasoning with salt and pepper, as desired. Pour the sauce over the beef, mushrooms, and onions. Serve over boiled potatoes or hot-buttered noodles. Julia recommends a side of buttered peas as an appropriate veggie side. This dish reheats exceptionally well. Simply bring to a gentle simmer on the stovetop for a few minutes, until all components are heated through. If you’ve got 30 minutes to spare, you can watch Julia cooking her beef bourguignon during the first episode of The French Chef HERE. Posted in Beef, Culinary Techniques, Food, Main Course, Recipes, Vegetable and tagged beef, beef bourguignon, Cooking, culinary technique, Food, food photography, french cooking, julia child, julia child's birthday, life, love, mastering the art of french cooking, Recipes. Bookmark the permalink. Last year, I got my breakfast in bed at the hospital, since I’d given birth to our third son the night before. But the year before that, my husband made me a delicious bacon, egg, and cheese bagel sandwich. It was fantastic. The boys came dancing into the room, buzzing with excitement over serving me breakfast in bed. They’d mostly just watched their daddy preparing the meal, but they took full credit for it. 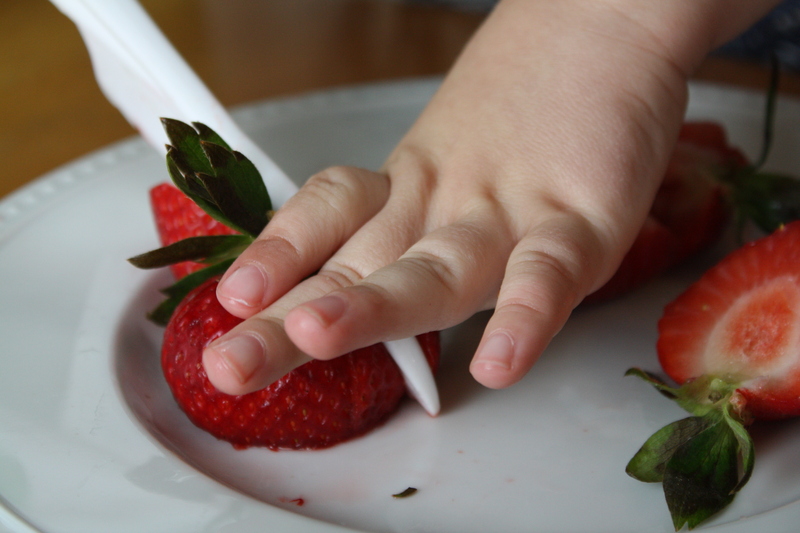 They may not have made that bagel sandwich, but even young kids are quite capable of preparing some pretty fantastic stuff in the kitchen (with a little help, of course). And there’s really nothing like that aura of pride which emanates from a child who just accomplished something awesome. 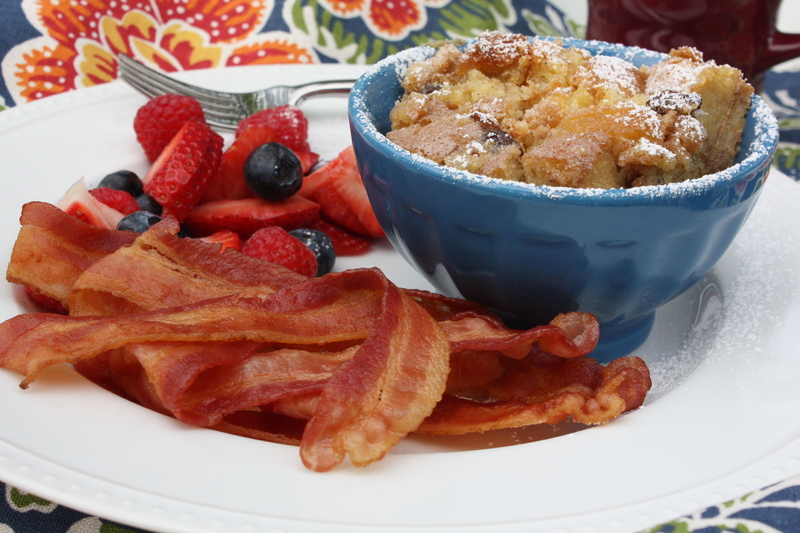 With that in mind, I’ve come up with a Mother’s Day breakfast-in-bed recipe which is so simple that even preschoolers can complete almost every step on their own, with just a bit of adult direction. 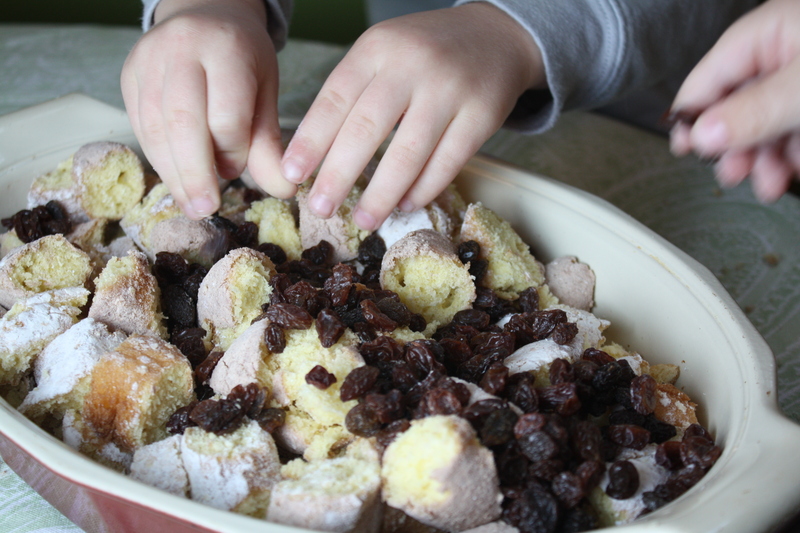 It starts with donuts, chopped into chunks, which are then sprinkled with raisins. Next, a mixture of half and half, sugar, eggs, vanilla, and cinnamon gets poured over the donuts. As it bakes, the donuts absorb the sweet, creamy mixture forming a lusciously decadent donut bread pudding. This is good stuff, people. Make it for yourself if no one is going to make it for you. But, if you’ve got some kids who’d like to surprise you for Mother’s Day, here’s a step by step photo guide for them to follow. Note to helper grown-up: It’s a good idea to gather all ingredients and supplies ahead of time, so you can move through the steps quickly. Young kids have a tendency to get distracted, lose interest, or start eating the donuts if you take too long between steps. Step 1: Wash your hands. Then, ask a grown-up to preheat the oven to 350 degrees. Step 2: Use a paper towel to spread one tablespoon of softened butter all around a medium-sized baking dish. Step 4: Arrange the chopped donuts in a baking dish. 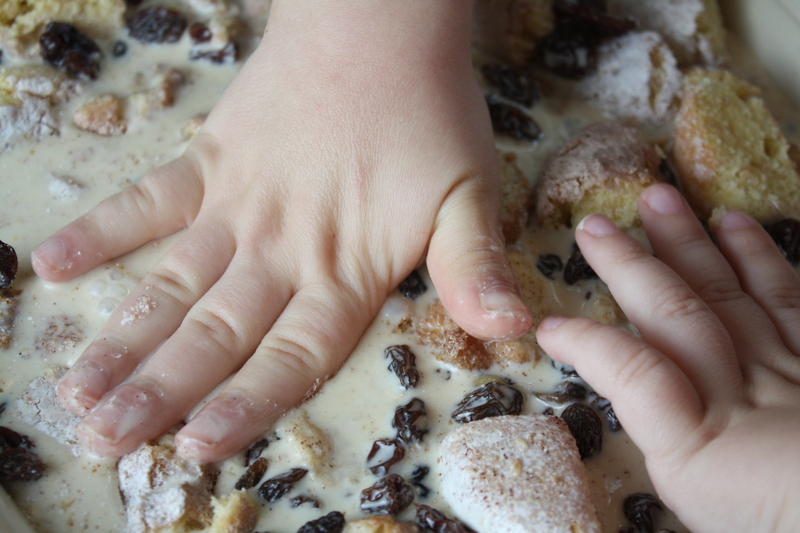 Step 5: Sprinkle the raisins overs the donuts. 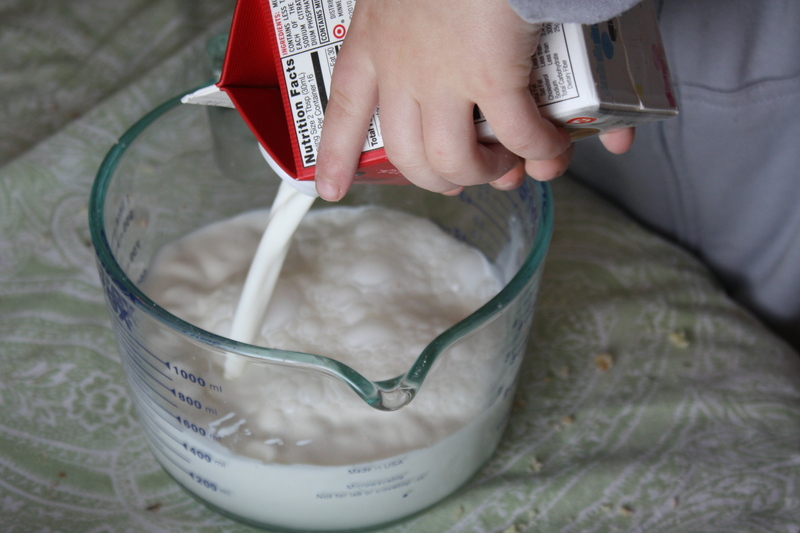 Step 6: Pour 2 cups of half and half into a large bowl or measuring cup. Step 7: Add 1/2 cup sugar. 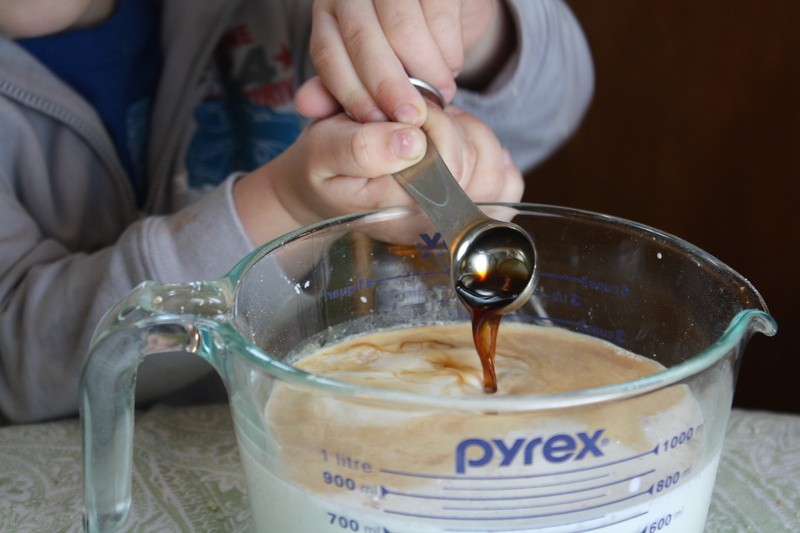 Step 8: Add 1 teaspoon of vanilla. 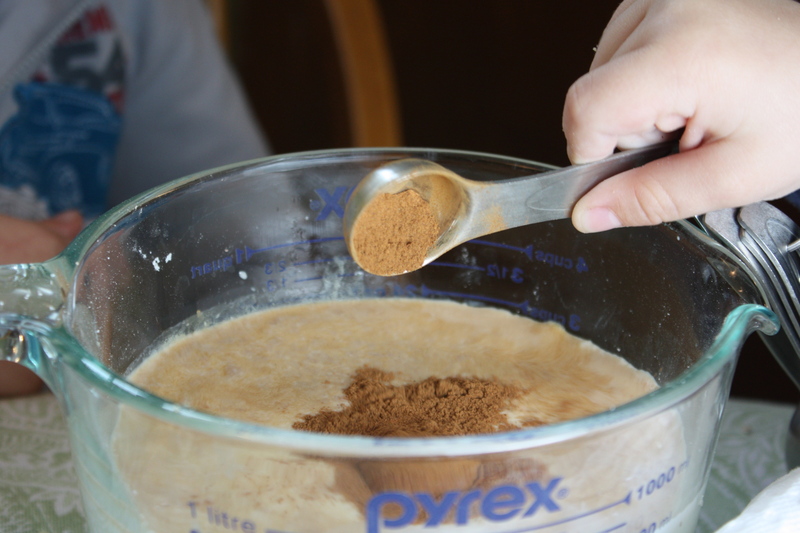 Step 9: Add 1 teaspoon of cinnamon. Throw a pinch of salt in there too! Step 10: Ask a grown up to help you crack 4 eggs into a dish. 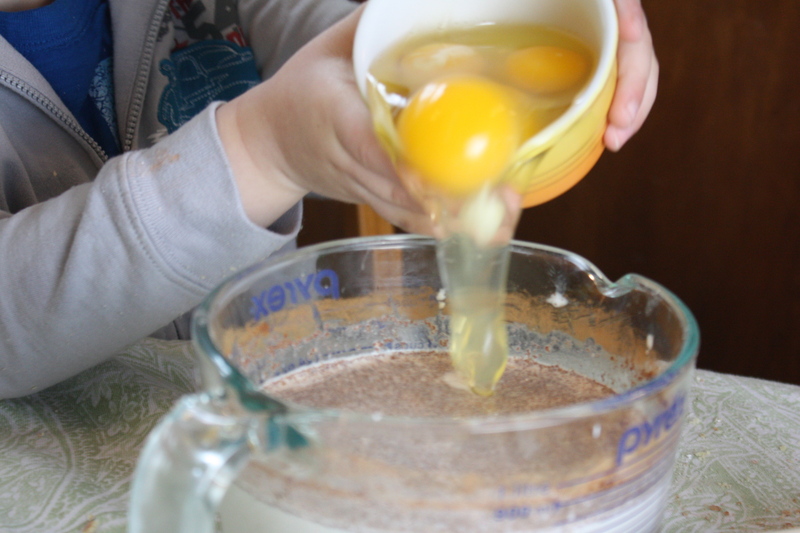 Then, pour the eggs into the half and half mixture. Step 11: Whisk the half and half mixture until it’s well blended. Step 12: Pour the mixture over the donuts. Make sure you pour some over every donut. Step 13: Gently press down on the donuts so they drink up the half and half mixture. 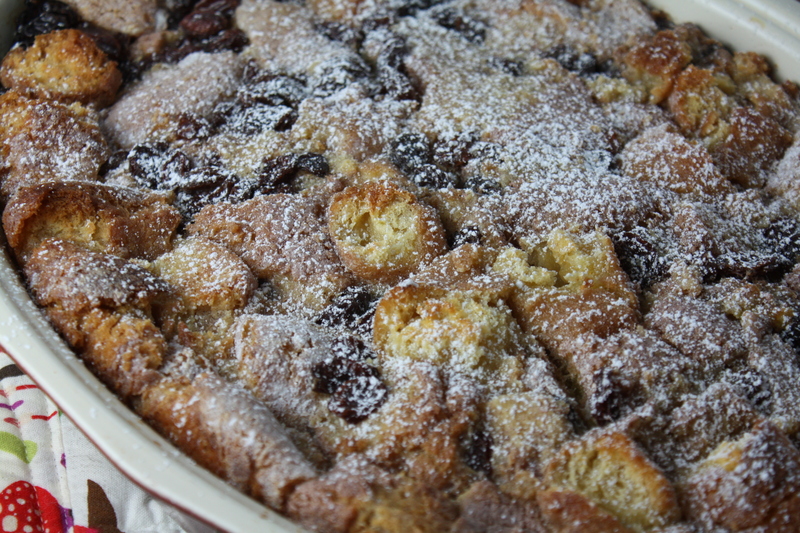 *The key to a great bread pudding is not to over-soak the bread (donuts, in this case). The donut chunks should be mostly submersed in the liquid, but not swimming in it. A few donuts peaking out of the top will help a nice crust to form on the top when it bakes. 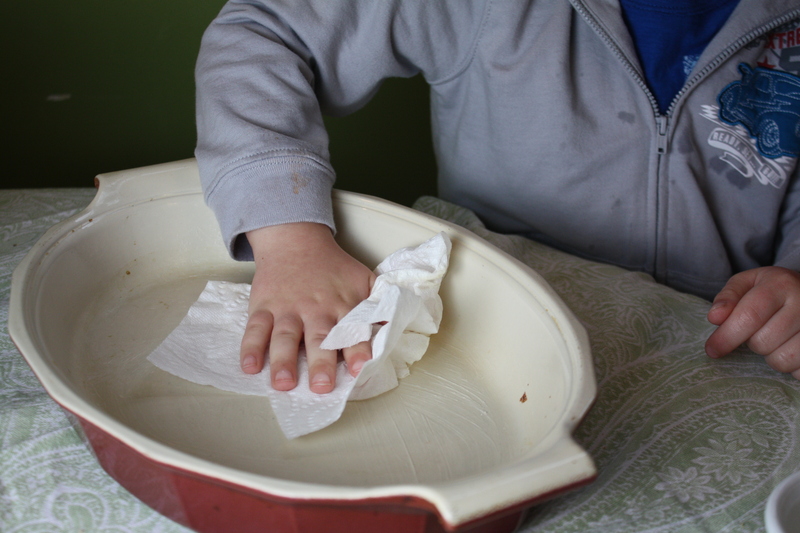 Step 14: Ask a grown-up to help you put the baking dish in the oven. Bake for 50-55 minutes. 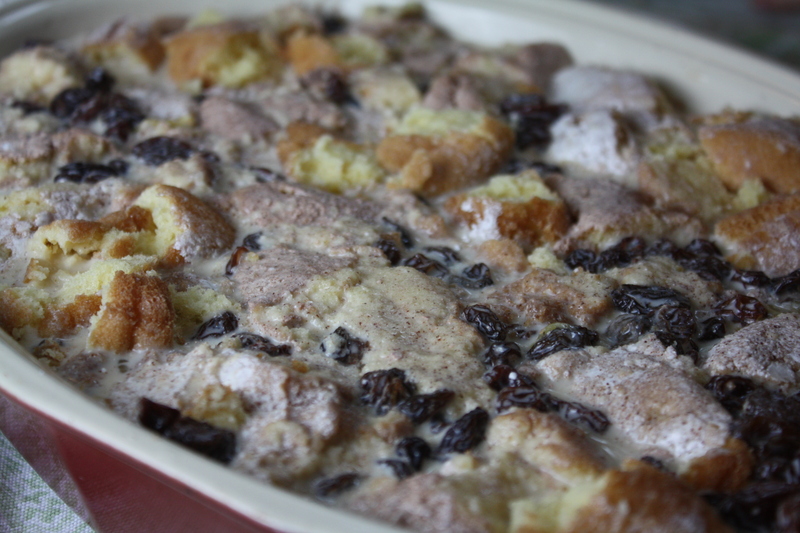 The bread pudding should look like this before it bakes. Step 15: Ask a grown-up to help you take it out of the oven. Sprinkle it with powdered sugar. Serve warm. 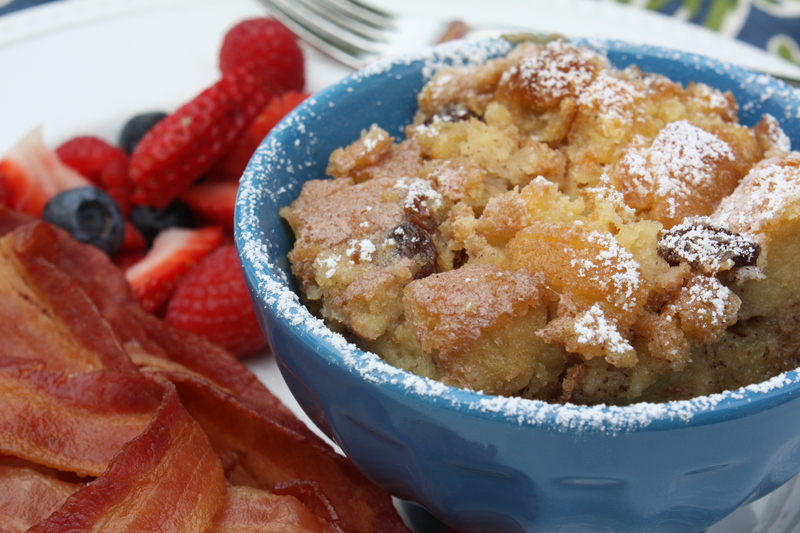 *If desired, the bread pudding can be made the day before and reheated in the morning. 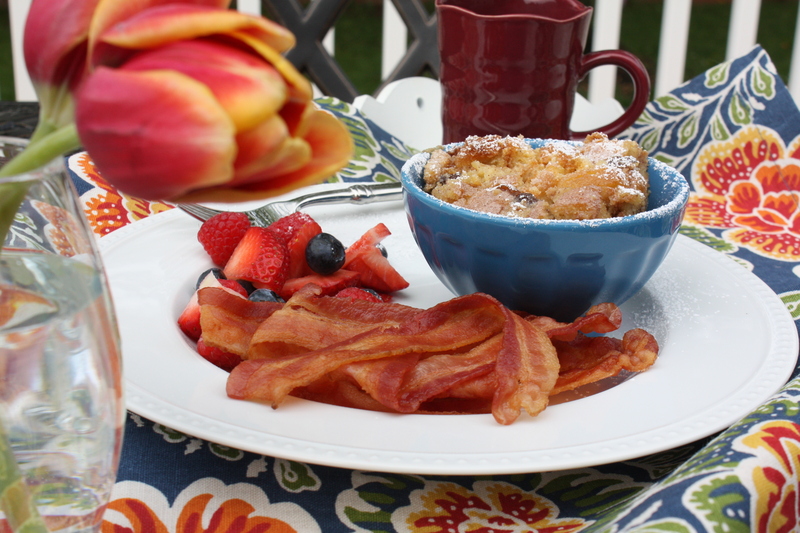 Cook a huge batch of bacon, because mommies like bacon. 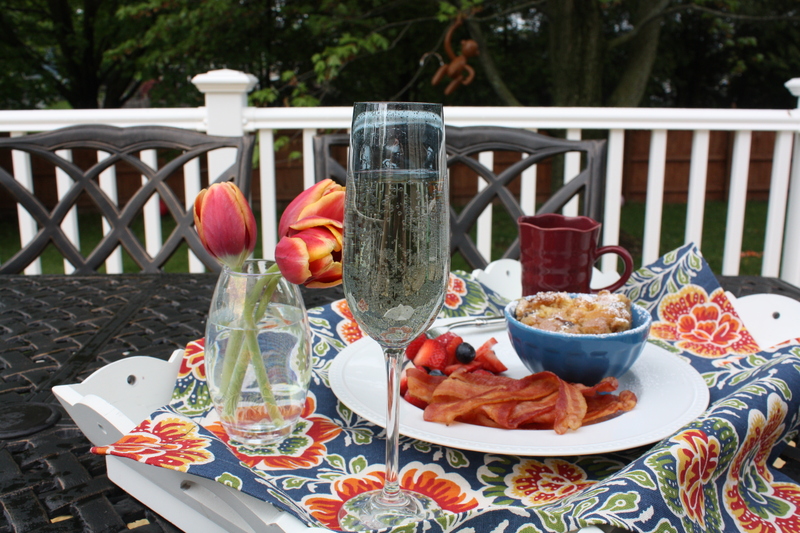 Ask a grown-up to pour a glass of sparkly champagne or sparkling white grape juice for Mommy, because it’s a special day. A cup of hot coffee would be nice too. Arrange everything nicely on a platter with a fresh flower or two and a handmade card. Your mommy will be in Mother’s Day heaven! Preheat the oven to 350 degrees. Lightly grease the inside of a medium sized baking dish with the softened butter. 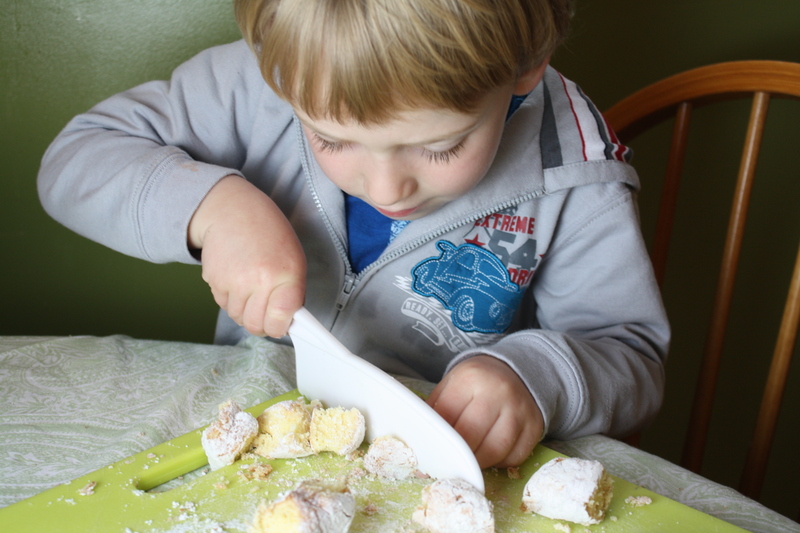 Chop the donuts into chunks (about 1″ square). 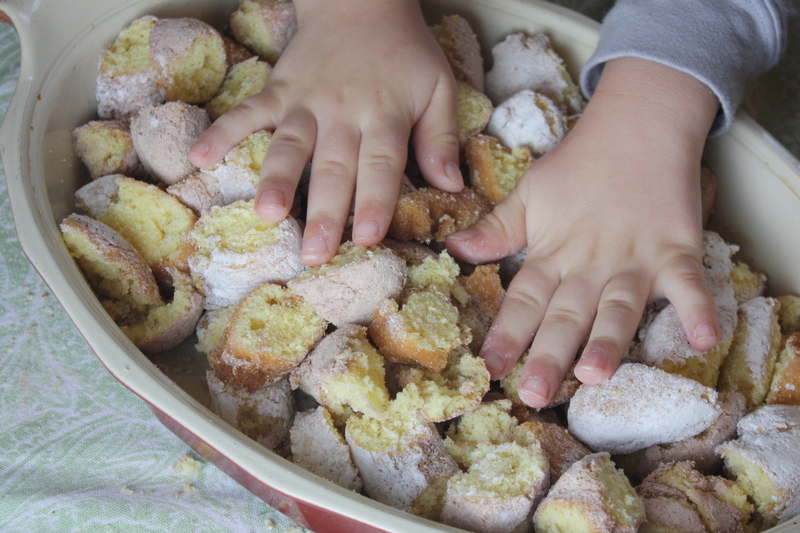 Arrange the donut chunks evenly in the baking dish. Sprinkle the raisins on top. 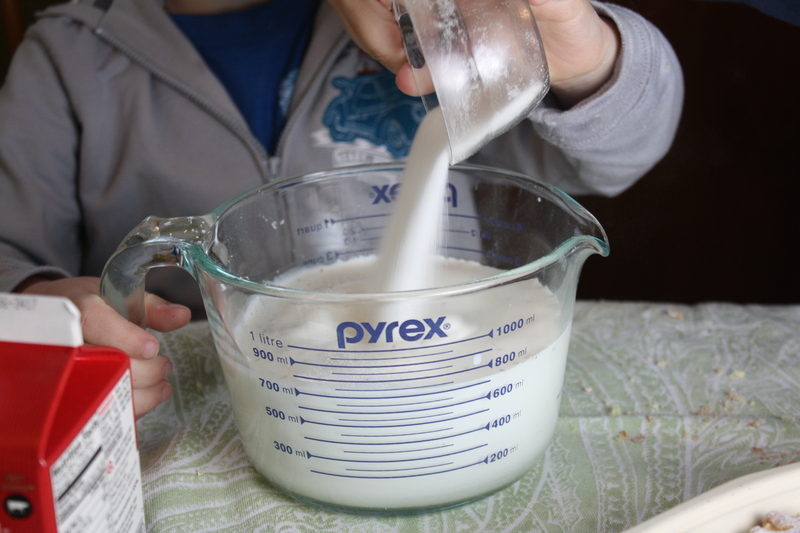 Combine the half and half, sugar, eggs, vanilla, cinnamon, and salt in a large bowl or measuring cup. Whisk to combine. 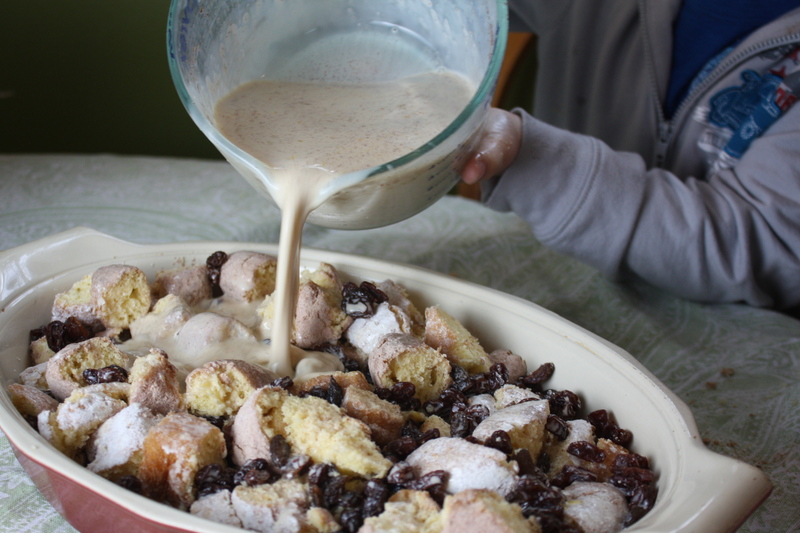 Pour the mixture over the donuts and raisins. (Try not to over-soak the donuts.) Gently press down on the donuts so they are mostly submerged in the liquid. Bake for 50-55 minutes. Sprinkle with powdered sugar. Serve warm. Posted in Baking, Breakfast, Cooking with Kids, Desserts, Eggs, Food, Fruit, Main Course, Recipes and tagged baking, breakfast in bed, brunch, Cooking, cooking with kids, dessert, Eating, family, Food, food photography, fruit, kids, life, love, Mom, Mother's Day, parenting, Recipes. Bookmark the permalink. You know those little dolls…the ones where you press their belly and they repeat a series of silly little things, like Mama, Feed me, and Goo goo gah gah? Well, my three-year-old is just like that, only his sound bytes are more like I love you so much, I don’t like you, and I’m freezing cold. Daddy’s goes something like, What’s for dinner?, I’m getting a beer, d’ya need anything?, and things like It’s a fact of life. Dogs don’t like to be disturbed while they’re eating and neither does Daddy. And Mommy’s is a bit like, Why in the world would you do that?, This room looks like a tornado blew through it, and Serenity now! It’s the I’m freezing cold one that I can’t wrap my head around. The kid stubs his toe…I’m freezing cold. I tell him that he can’t have another cookie…I’m freezing cold. It’s time to get dressed for school…But, I’m freezing cold. I tell him, You keep saying that. I do not think it means what you think it means. Hey buddy, it’s time to clean up your toys. Why can’t you clean up your toys? It’s just that…I don’t like you. Ok, that’s fine, but you still need to clean up your toys. Well, put on a hoodie and then clean up your toys. I love you too. Now…Clean. Up. Your. Toys. This room looks like a tornado blew through it. It IS winter time though, so if you’re freezing cold, it’s probably with good reason. And I’ve got just the thing to warm you up! Winter is the time for foods which fill our bellies and leave us feeling all toasty and satisfied. January also happens to be National Soup Month. 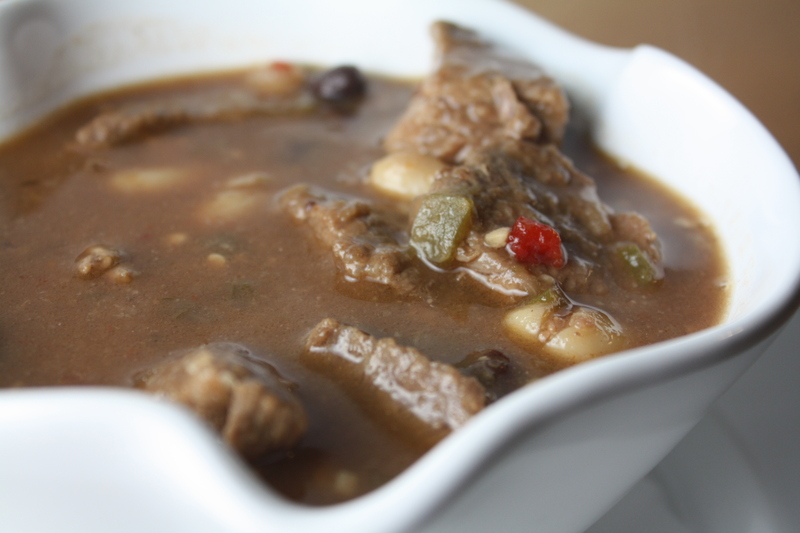 So, it’s the perfect time for this Spicy Beef and Bean Stew, made with tender, slow-cooked beef and fresh jalapeño peppers. The broth gets its thickness from a puree of white beans, rather than the typical butter/flour roux. 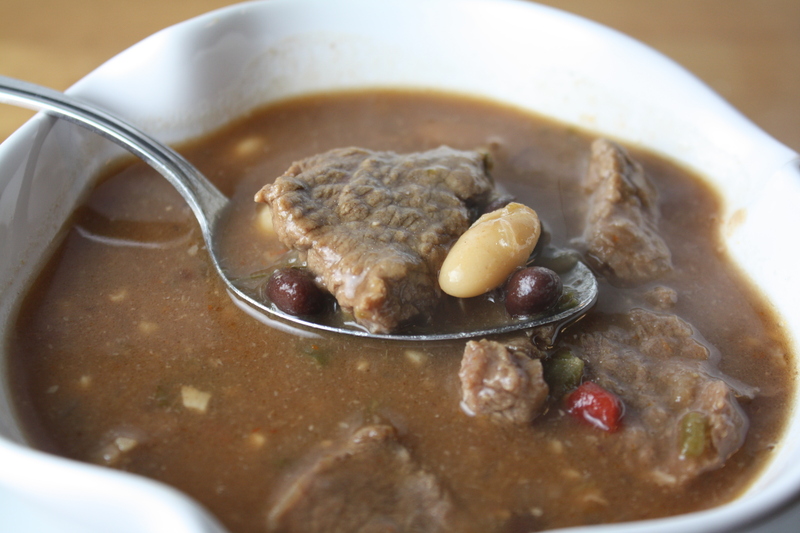 This is a rich and satisfying stew, which also happens to be extra-rich in protein and lower in high glycemix index carbs than traditional flour-thickened meat and potato stews!! Preheat oven to 325 degrees. In a large ovensafe saucepan or dutch oven, heat olive oil over medium heat. Add the onion and cook for 3-5 minutes, until tender. Add the garlic and jalapeño peppers. Cook for 2-3 minutes more, stirring frequently. Raise the heat to medium high and add the beef. Brown the beef on all sides. Add the marsala wine and allow it to simmer for a minute. Then, add the beef stock, tomato paste, and salt. Stir to combine. Bring to a simmer, then cover with a tight fitting lid and place the pan on the middle oven rack. Cook for 2 hours. 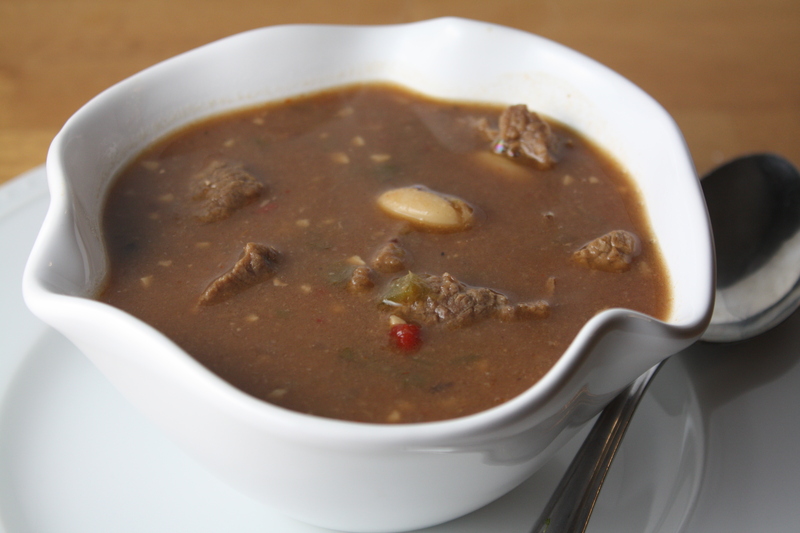 While the beef is cooking, puree one can of the cannellini beans and their liquid in a blender or food processor. Set aside. Drain the other two cans of beans. After two hours, remove the cover. Stir in the pureed beans and the whole beans. Cook, uncovered, for 20 minutes more. Remove from the oven. Taste and adjust seasoning with salt and black pepper, as desired. Posted in Food and tagged beans, beef, comfort food, Cooking, diet, easy dinner, Eating, family, food photography, kids, life, parenting, Recipes, soup, south beach, weight loss. Bookmark the permalink. Recently, we picked up one of those Kinect sensors for the Xbox 360. We figured it would provide for some active fun for the boys during the cold, indoor winter months and even get us big kids moving a bit more to help out with our fitness goals. Some of the games in Kinect Adventures really get that heart rate pumping! And I’m waiting on my copy of Dance Central 2 to arrive, so I can totally bust out my sweet dance moves (in complete private, when nobody else is around). Ok, so the Xbox doesn’t know how to make my dinner. Yet. But I’m sure that software upgrade is just around the corner. Seriously, the robot revolution is upon us. Are you prepared? The other day, as I was trying to teach the kids not to wander aimlessly in front of other people while they’re playing with the Kinect, I found myself saying, You can’t walk in front of people because it confuses the Kinect. It’s not smart like us and it can’t figure out who it’s supposed to be tracking when there are too many people moving around. And as soon as the words came out of my mouth, I wanted to eat them. The Xbox just heard me, questioning its intelligence. I swear I heard the little camera eye move to focus closer on me in that moment, recording and passing judgement on me as an enemy of the robot uprising. I’m doomed. I instantly started fumbling my words, trying to make my insult to the Kinect seem less degrading. I love you, Xbox. Please don’t annihilate me. But since the Xbox is not about to prepare my meals anytime soon, I suppose that leaves me to do it… Hubby and I are still going strong with our lower carb diets. Today marks Day 8 of our diet and I’m down…drumroll, please…6 pounds!! Not a bad start, if you ask me. The weight won’t continue to come off at a rate of six pounds per week (nor should it), but it’s certainly a motivating start. The best part is that we have been dining on some pretty fantastic food this week. 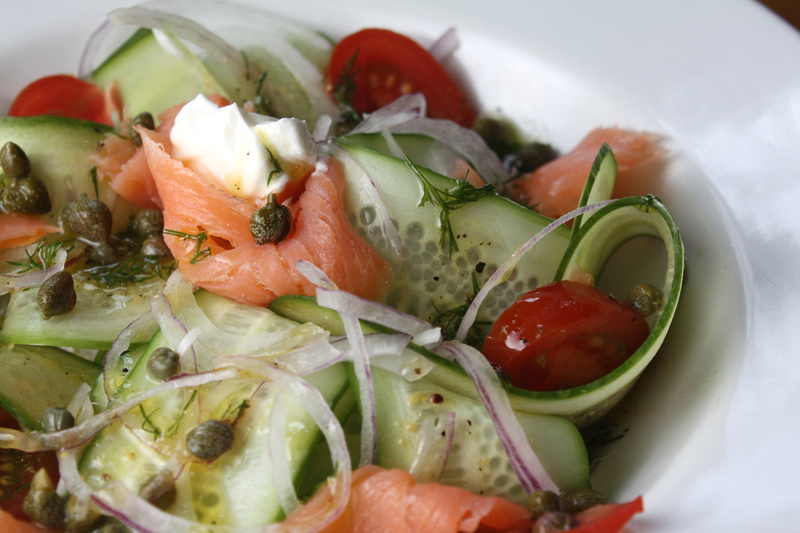 Like this smoked salmon and cucumber salad which is the stuff that dreams are made of. So fresh and simple. So insanely delicious! To prepare the vinaigrette, whisk together the olive oil, vinegar, mustard, dill, salt and pepper until well combined. 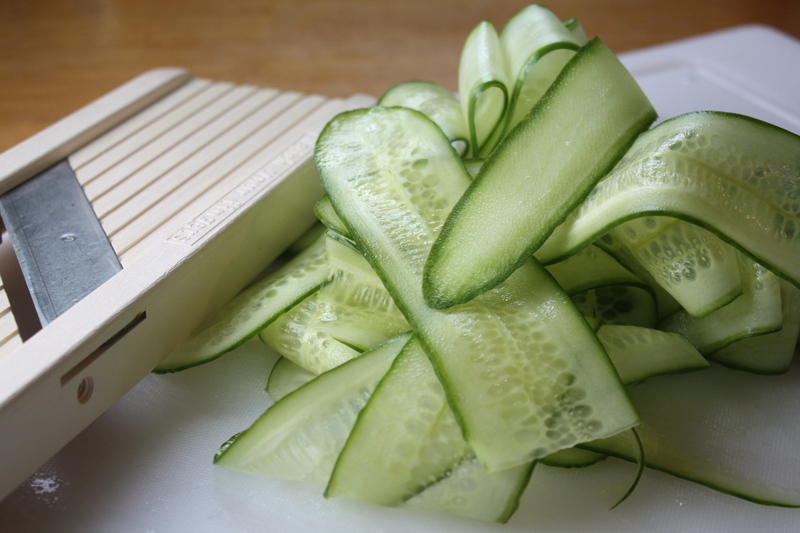 Cut the cucumber in half, then use a mandolin slicer or a very sharp knife to very thinly slice the cucumber, lengthwise, into ‘ribbons’. Place a mound of the cucumber ribbons in the center of each plate. Scatter the onions and tomatoes over the cucumber. Tear the salmon into small pieces and scatter over the salad. Place a larger piece of salmon in the center. Sprinkle the capers over the salad. 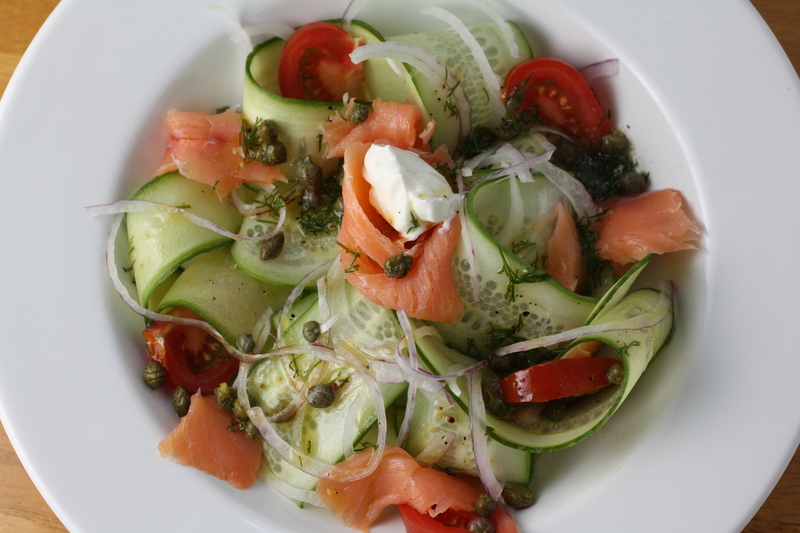 Drizzle each salad with the dill dressing. 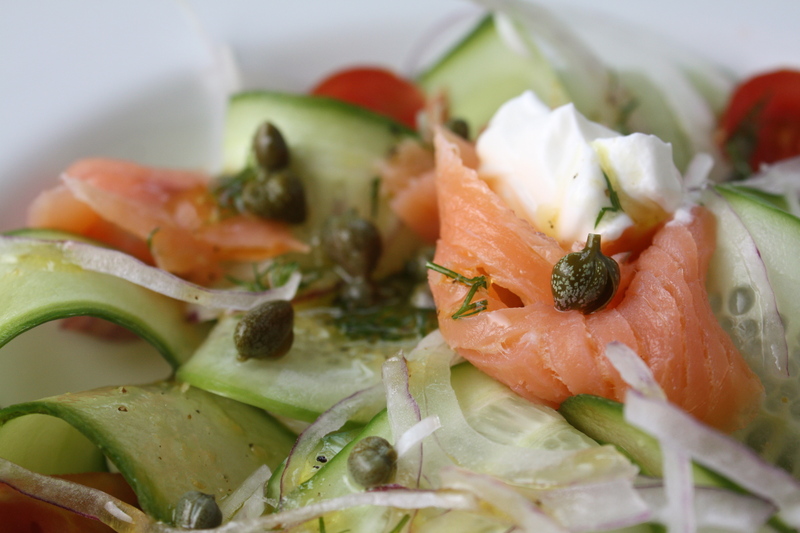 If desired, garnish the center piece of salmon with a small dollop of creme fraiche or sour cream. Diet Day: 8 Weight Loss: -6 Motivation: High! Posted in Dressings and Condiments, Food, Main Course, Recipes, Salads, Seafood, Side Dishes, Vegetable and tagged comfort food, Cooking, diet, easy dinner, Eating, family, fish, Food, food photography, games, kids, kinect, life, parenting, Recipes, salad, seafood, south beach, south beach diet, technology, weight loss, xbox, xbox kinect. Bookmark the permalink.